Silver and gold add the sparkle to natural decorations. The next Christmas shopping stop on my list is B.D. Jeffries in Atlanta, Georgia. The store is brimming with gifts for everyone on your Christmas list. 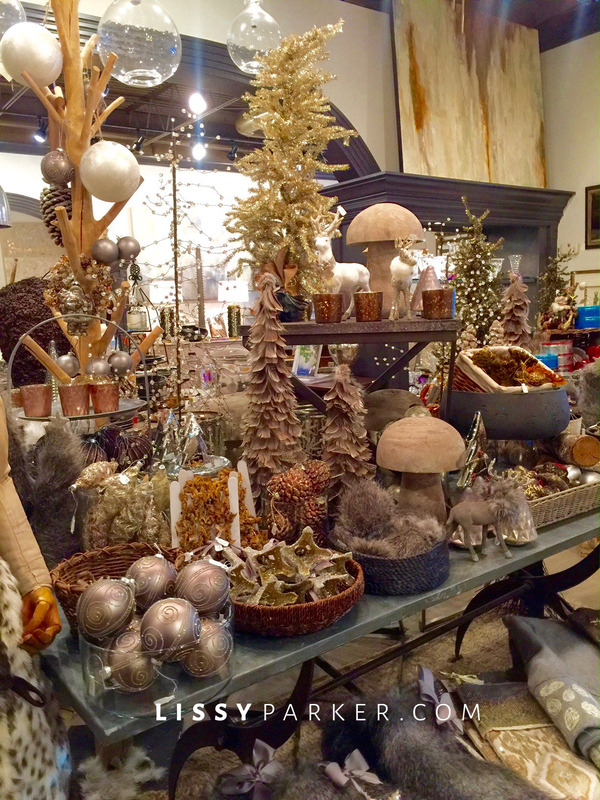 They have a lavish collection of natural tree decorations with a little silver and gold to add holiday sparkle. I love all of the fur trimmed gloves and the leather trimmed sweater wraps. The leather accessories for the men in your life are handsome and will put a smile on his face. The slippers and scarves would make wonderful stocking stuffers for the girls on your list—and don’t forget that sweet stuffed animal for the little angels. Be sure to take a look at the large selection of china, glassware and serving dishes to make finish your holiday table. Happy shopping and Merry Christmas! Nest Holiday candles are a great idea. Decorating books are on my list. They even have furniture if you have a really big list. How warm and snuggly would this gray throw be. Add these warm slippers to your list. I need this leather trimmed wrap. A girl always needs gloves. They have a large selection of sweet treats to choose from. Cutlery would make a great gift. Silver trays could be used in any room in the house. I am crazy about this gray marbleized china—maybe I need retail therapy. Tinsel trees are great for the table top. These little sweet stuffed animals would make a great gift.